The Eurasian golden oriole (Oriolus oriolus) belongs to the family of Old World orioles, the Oriolidae. The Eurasian golden oriole species is distributed in western, central and southern Europe, central Asia, west Asia, northern Africa and southern Africa. These oriole species winter in central and southern Africa. These orioles are monotypic species. The Eurasian golden oriole (Oriolus oriolus) is a medium-sized typical golden oriole, measuring 23 to 26 cm in length and weighing 40 to 100 grams. These species are sexually dimorphic. 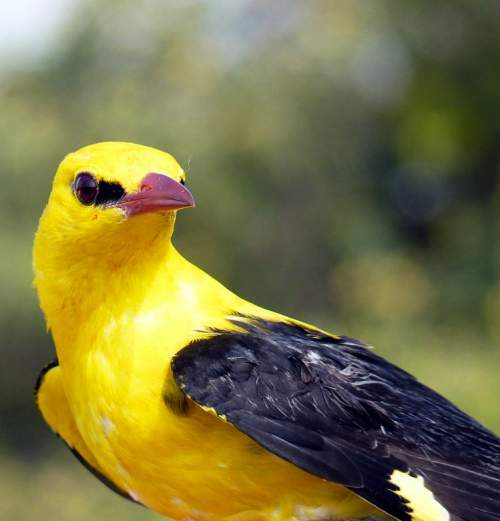 The male Eurasian golden oriole has golden-yellow head. The lores are black and extend only up to the eye. The upperparts and entire underparts are rich golden-yellow. The velvet black wings have golden-yellow patch. The primary coverts are also golden-yellow. The female golden orioles have brown and yellow vermiculated upperparts and white underparts with brown streaks. The undertail coverts are yellow. The tail is blackish and plain. The bill is moderately long, slightly down curved and pinkish red in color. The tip of the upper mandible is curved. The irises are dark brown. The legs are gray. The call of these Eurasian golden oriole species is a loud, fluty whistling "weeka-weela-weeo-wee-ooo" sound. These Eurasian golden orioles are distributed in western, central and southern Europe, central Asia, west Asia, northern Africa and central and southern Africa. Vagrants have been observed in India, Madagascar, Seychelles, Niger, Congo, Benin, Lesotho, Mali, Gabon, São Tomé e Príncipe, Ireland, Iceland and Faroe Islands (Denmark). These Eurasian golden oriole species have high forest dependence. They normally occur in altitudes from 0 to 2400 meters. The artificial ecosystems and habitats of these species include plantations, rural gardens, orchards and urban areas. 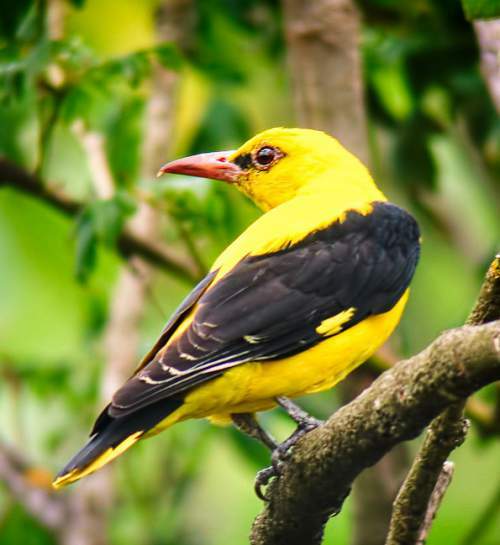 The natural ecosystems and habitats of these Eurasian golden oriole species include open woodlands, tropical and subtropical dry forests, mixed broadleaf woodlands, tropical and subtropical moist montane forests, riverine forests, dry savanna and dry shrublands. 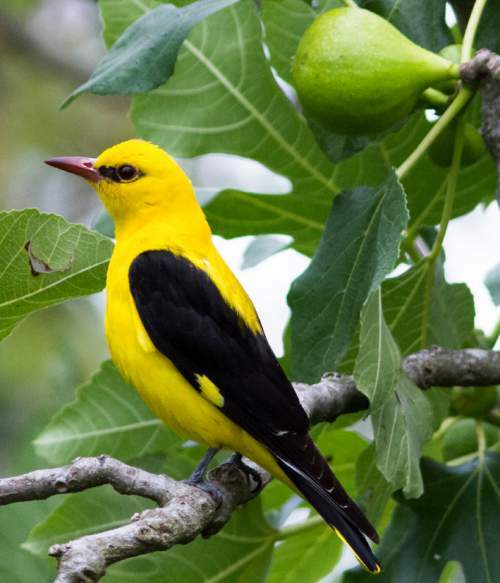 The diet of these Eurasian golden oriole species consists mainly of small invertebrates. Insects, grasshoppers, dragonflies, ground beetles, scarab beetles, wasps, bees, spiders, fruits and berries are their primary food. These Eurasian golden orioles occasionally feed on plant material like seeds, nectar, pollen and buds. In rare occasions they may take small lizards, small mammals, eggs and nestlings. The breeding season of these Eurasian golden orioles is from May to early July in most of the breeding territory. The nesting site is usually a thin, horizontal forked branch, high in the periphery of tree canopy with thick foliage. The Eurasian golden oriole nest is a suspended hammock-like structure built on horizontal forked branch. Much of the nest building is done by the female. The nest is built with plant fibers, sedges, reeds, leaves, twigs and strips of bark. The nest is lined with fine grass, feathers and wool. The typical Eurasian golden oriole clutch contains three to five white or cream colored eggs with black spots. The female incubates the eggs and broods the hatchlings. The chicks hatch out after 16-17 days and fledge after 17-18 days. The parents feed the young and protect them. These Eurasian golden oriole species are fully migratory birds. The breeding populations occur in western, central and southern Europe, central Asia, west Asia and northwest Africa. These populations migrate southwards to central and southern Africa during August and September for wintering. During this period, passage birds can been seen all over the north Africa. The return migration to the breeding grounds occurs in early spring. The global population size of the Eurasian golden oriole (Oriolus oriolus) is estimated at 17,480,000 to 32,000,000 mature individual birds. The overall population trend of the species is considered to be stable. In most of its range, this Eurasian golden oriole species is reported to be locally common. The generation length is 3.7 years. Its distribution size is about 26,600,000 sq.km. Habitat alteration and destruction, deforestation, hunting for food and sport hunting are the main threats that are endangering the survival of these Eurasian golden oriole species. The Eurasian golden oriole (Oriolus oriolus) does not approach the thresholds for being Vulnerable, either under the range size criterion, or under the population trend criterion or under the population size criterion. The IUCN (International Union for Conservation of Nature) has categorized and evaluated the golden oriole species and has listed it as of "Least Concern". The CITES (Convention on International Trade in Endangered Species of Wild Fauna and Flora) status is ‘Not Evaluated’ for the Eurasian golden oriole (Oriolus oriolus). The Eurasian golden oriole (Oriolus oriolus) is closely related to the Indian golden oriole (Oriolus kundoo), African golden oriole (Oriolus auratus), black-naped oriole (Oriolus chinensis) and slender-billed oriole (Oriolus tenuirostris). Earlier it was considered conspecific with Oriolus kundoo. Current topic in Birds of India: Eurasian golden oriole - Oriolus oriolus.